Recently when my sil visited us, she got along some five different varieties of greens. She gets excellent good quality greens at throw away price and makes greens related dishes almost four times a four. With grown up kids, she doesn’t have any problem of picky eaters. However when I myself don’t gel so well with it, I tend to avoid making, though I love it when eating. Some of the greens were beyond my understanding and so packed it off to Amma. She told me that all the greens are very popular in Andhra and the dishes are famous in terms of traditional methods and for their health benefits. Of course, off late all are moving towards healthy eating habits and including greens in their diet has become a norm. Whatever reasons, I was happy that I got to enjoy another traditional Andhra dish. The greens used in this dish is called Chukka Kura. 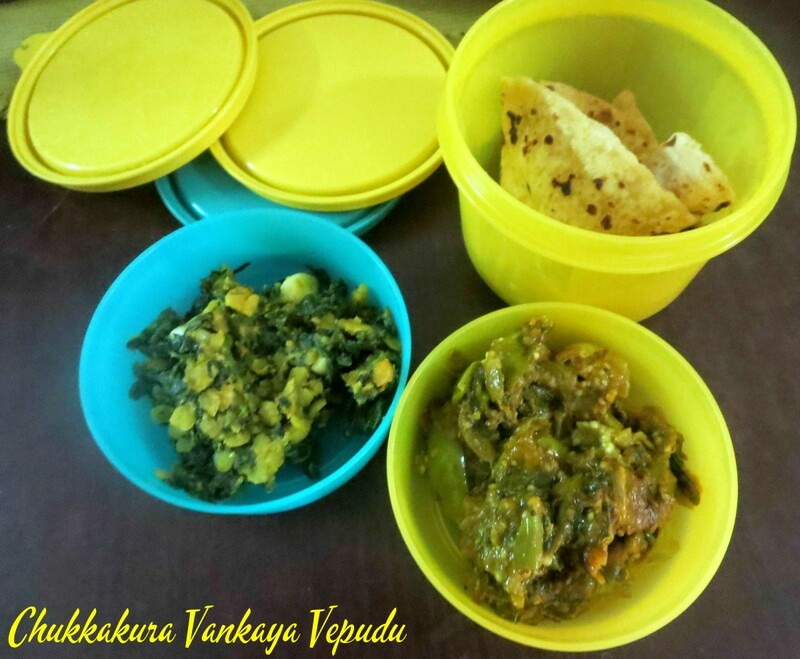 While leaves are Aakku in Telugu, all edible greens are called kura/koora. So this greens are paired with Brinjal. Brinjal in general is a favorite vegetable for the Telugus and it makes a great combination with the greens in this dish. The dish is a dry saute, served with dal or sambar for lunch. I took it for my lunch along with Rotis. The other greens recipe will follow for next week. Anyway I had a wonderful meal with these two dishes.I read on the Internet that this greens is also called as Khatta Palak. Wish I had clicked a picture before cooking it. Wash and chop the leaves, keep it aside. Cut brinjal into julienne. Heat a pan with oil, saute onions till they turn colour, then add ginger garlic paste, saute well. Now add green chilies, brinjal pieces, combine everything well. Add salt and turmeric, cover with lid and simmer for 5 mins. Now add Red chili powder, chukka kura, coriander powder and cumin powder. Combine and simmer for 5 mins. Keep stirring and cook for 5 mins. 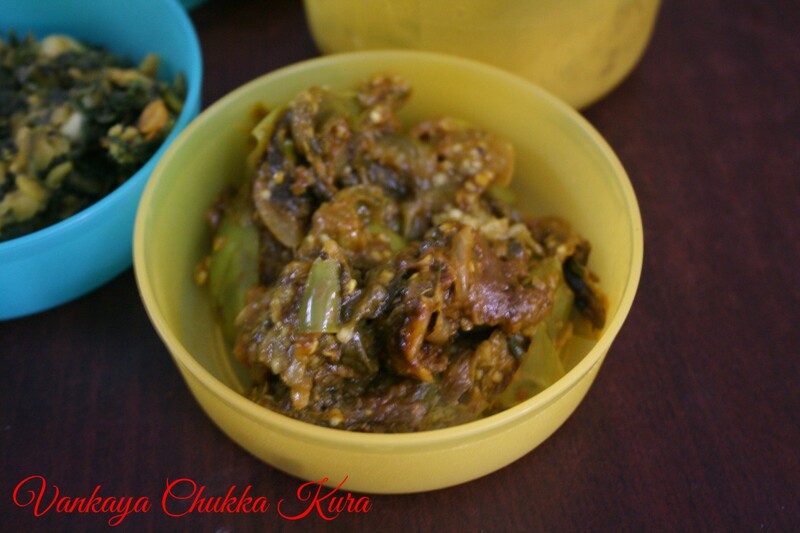 This dish cooks only till the brinjal is cooked, the leaves are quite tender and gets cooked fast. This goes for the June Week 4, Cooking from Cookbook Challenge Group. Chukkakura is one of my favorite greens but we don't get it here in the grocery stores. I'm growing them in a small container in my garden and will have to harvest it real soon. This is such a yummy kura with eggplant and chukkakura. Will try this combo some time. I do not know about vankaya chukka kura combo but mutton & chukka kura is an awesome combination. I know you do not eat meats but try it for your family. They might like it. Thanks for the feedback Manjula, glad you liked it.